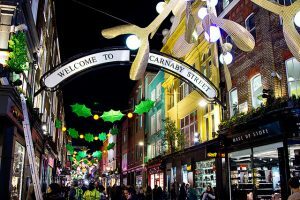 Providing an atmosphere that’s almost impossible to not enjoy, it’s no real surprise that guests flock to London at this time of year – and although coming for a day shopping trip is popular, it becomes all that more special when you extend your trip to a full weekend of Christmas activities. One of the most notable reasons behind this is although coming to London to shop for Christmas for the day is better than not coming at all, it can take precision planning to make sure you hit even a small selection of stores on your list. Let’s assume you want to get into the real Christmas spirit. You’re going to want to see the Christmas displays and floors at Liberty, Harrods and Selfridges. Now without even thinking about it you could spend an hour or two in each of these stores (particularly Liberty on their Christmas floor – there’s something truly awe-inspiring about the eclectic mix of gifts they have within their wonderfully traditional building). Add in an hour or two for lunch and without looking at the time needed for travelling between these three stores and your lunch venue, eight hours could have easily passed. For many, that will be almost their full day gone. But what about the long-established shops of Mayfair? Or Carnaby Street, one of London’s most iconic destinations due to its fame in the 1960s? We’ve not even touched on any of our city’s beloved markets, nor any of the pop-up Christmas markets that appear throughout the city (the market on the South Bank has drawn a lot of excitement this year already – and it doesn’t open until 9th November!). London is one of the world’s most popular shopping destinations. With something to suit all tastes, requirements and needs, you could spend a week here and still not visit a fraction of the shops. So when it comes to Christmas, a day of shopping can be brilliant, but it becomes much easier to take in more than a handful of stores if you’re in the city for longer than a few hours. One of the most popular events of its kind anywhere in the world, the Winter Wonderland in Hyde Park has attracted over 14 million guests since it first opened for the Christmas period in 2007. Offering a truly memorable experience to all who visit regardless of how old you are, there’s everything from ice skating and roller coasters through to ice bars and a circus, all within the grounds of Hyde Park. Open for 12 hours each day from 10am to 10pm throughout most of November and December, it’s a must-see for anyone wanting to get into the Christmas spirit. But given the sheer amount to do within the Winter Wonderland, it’s almost impossible to do anything more than grab a fleeting glance from afar if you’re primary intention is to shop. Of course, there are places to spend your money in the Winter Wonderland itself, but once you’re in the grounds, you’ll soon find yourself swept along with the festive spirit, enjoying a mulled wine whilst you play fair games before standing in line for the giant observation wheel. Clearly a must-see at this time of year, a decision needs to be made – do you sacrifice some shopping time, or do you spend an extra day so you can truly soak up the Winter Wonderland magic? If you take one thing from the two points above, it’s that Christmas in London is busy. There’s so much taking place that wherever you turn there are activities and attractions for all. And plenty of people try to fit it all in. Or at least they try to sample as much as they can. They’ll get into the city at 8am, book a last train for 10pm, and spend 14 hours not stopping. They’ll be shopping. They’ll be eating and drinking. They’ll be going on rides. They’ll be getting into the full festive atmosphere. But then they’ll be exhausted. They’ll be tired, worn out and in need of a few days to recover. When you realise this is the case, the alternative becomes so much more appealing. Sure, you can start your day early and you can finish it late, but instead of trying to pack Liberty, Harrods, Selfridges, Christmas markets, Hyde Park Winter Wonderland and everything else into a single day, split it over at least two days. Do your shopping on day one and then rather than jumping back onto a train or into a car for a long journey home, head straight back to a central London hotel for a night cap and a comfy night’s sleep. Wake up feeling refreshed the next day and, fuelled by a wonderful breakfast and with your shopping complete, be ready to enjoy the magical parts of London’s Christmas festivities. We’ve talked before about whether it’s possible to see London in a day. Whilst the answer is undoubtedly yes, it takes a lot of planning to see even just the most notable of sights. Take this challenge to the Christmas period, accompanied by a list of presents you need to buy, and although it’s possible to come Christmas shopping in London for the day, extending your stay for a Christmas weekend just makes it all that more enjoyable. And when you’ve had a long, busy year, who doesn’t deserve to treat themselves for a night or two in the capital?